My husband walks down stairs and sees me standing in the kitchen, cup of tea in hand, staring at the fridge. “What’s up, Mama?” he asks. 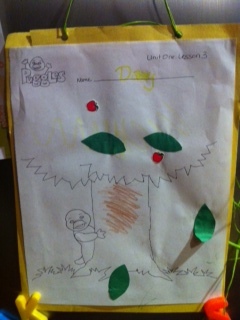 “Just admiring the first piece of craftwork from our son that we’re able to hang on the fridge,” I reply back while admiring the tree with the leaves and apples Davey did tonight at church. We started up a new family tradition tonight. As many of you may already know, I clean my husband’s office twice a week for a little extra spending money. Usually Davey and I head down on Tuesday afternoons, but we decided to change that up this week in order to go to church. I packed a picnic dinner for us which we ate after I cleaned and then we took off to church. Our church has a little kid’s thing called AWANA Puggles. Davey gets an hour with his friends from church, plus craft time, story time, and a few teachings about Jesus. While Davey is there, my husband and I are with the adults having our own time learning about the Bible. It’s a win-win situation for our family. So, tonight, after Bible Study, as I’m picking Davey up, I get the “report card” (which is just a verbal one) of how Davey did. Because Puggles is later in the evening and ends close to Davey’s bedtime, I worried about how he would be. Would he be invited back? The report was excellent and I understand that my son is quite the entertainer. I’m not at all surprised. I suppose what excited me the most; however, was to have my first piece of artwork to hang on my fridge. As soon as I came home, the first thing I did was to fish it out of his diaper bag, get rid of a few items that were worthless on the fridge, and then display it proudly. As a matter of fact, I’m taking the occasional break while writing this blog just to look at it. Pretty soon you won’t be able to tell I have a stainless steel fridge and I can’t wait!